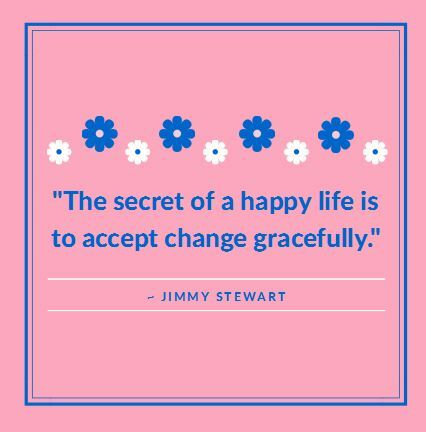 The secret of a happy life is to accept change gracefully. Change happens. That’s a fact. Some changes we embrace wholeheartedly, some we tolerate and some we outright object to with disdain. But either way, change happens. Change can give us a little comfort time when things are quiet so we can rest. Change can rev us up to motivate us. Change can push us far out of our comfort zone in order to learn life lessons and be stronger, better, and more at peace after the storms. I love this quote from Jimmy Stewart. I hope that it gives you a little peace in knowing that it’s a choice in how you view the changes in your life. Embrace them and accept them. Divine Timing happens for a reason.